We collect about 30% of the rainwater off the roof into a Schutz 1000 Litre water tank installed under the hosue (see photo to right). I got the tank on eBay for about $200. That is $0.20 per litre! The tank is fed from two 200 Litre barrels which i got for about $30 each. 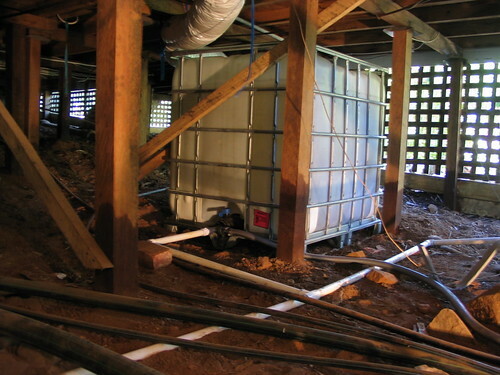 A float switch in one of these barrels is wired to the house controller to indicated that the system is full. The controller dumps water to a garden sprinkler for 5 minutes each time the barrel fills. This way we can make a small rainfall seem like a much larger rainfall on dry areas of the garden. 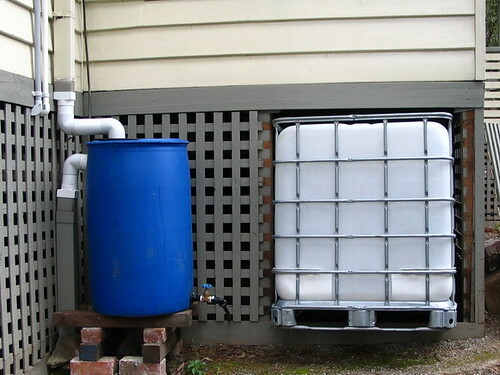 We try to minimise rainwater leaving the property. An electric pressure pump draws from the tank and provide 500kpa static pressure. This connects via a solenoid into the EWSS manifold as the garden sprinklers are used as part of the EWSS as well as for standard garden watering. These Schutz water are advertised on eBay with a range of outlet sizes. Mine has a 80mm diameter outlet. Adapters to more common fittings are also advertised on eBay but the 80mm adapter was going to cost me about $50. So, instead I drilled a hole in the screw on cap and fitted a 1" tank outlet. The cap did not have an O ring so it was not water tight so I put a lot of jointing paste and that did the trick. The tank outlet did obstruct the tanks valve so it no longer opens fully, but it open more than enough. The connection to the Schutz tank outlet. So, if the rainfall was collected in a small tank or sump and then transferred to a larger holding tank then a transfer pump needs to transfer at 2000 litres per hour which is 33 litres per minute. 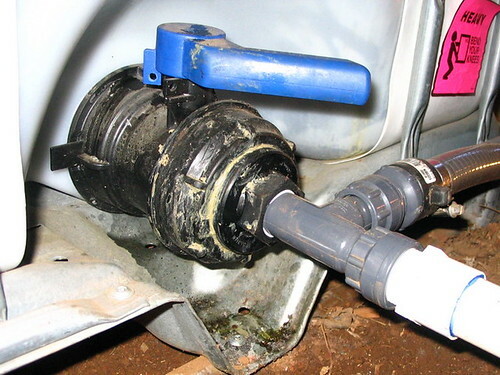 To use the above pumps would require a controller to activate the pump (can a pressure controller be added?). Alternatively a pressure pump can be used with simple 24Vac series wiring of a high tank full and low tank not empty float switches operating a 24Vac solenoid. Good for the DIY approach I so like.